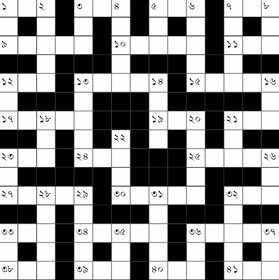 A crossword, or crossword puzzle, is a popular type of word puzzle. 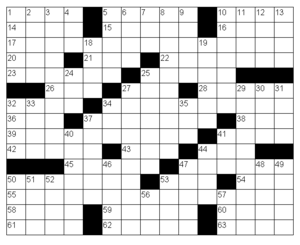 A crossword is made up of black and white squares (called a 'grid') and a list of clues. The answer to each clue is a word or phrase. The aim is to write the words letter-by-letter in the white squares. The white squares go "across" or "down" the page. Each clue has a number - for example "1 Across" or "15 Down". There are many types of crosswords. Straight (or Quick) crosswords are usually made up of simple definitions - which means that other words are used to describe the answer. Some crosswords use riddles and word play and are usually more difficult than straight crosswords. 1B 9A 2A . .
9U . 9L . .
Crossword Facts for Kids. Kiddle Encyclopedia.